The engineering profession encompasses a wide range of industries whether it is construction, IT, medicine, transport, space, environment or entertainment. The profession is not stagnant due to tremendous innovation in the engineering fields. Thus there is no doubt that engineers are required in almost every country today. Australia also welcomes talented engineers from all across the world. We cannot deny that Australia itself has made significant contributions in the engineering fields. That is why engineers are one of the highest paid professionals in Australia starting from the entry level to advanced jobs. The Engineers Australia Skill Assessment is an easy way for engineers to secure a permanent residence in Australia. The Engineers Australia is the leading community of engineers in Australia. It is the assessing body that evaluates the engineering occupations for migrants. Hence, engineers who are willing to secure a permanent residence in Australia need to get their skills and competencies evaluated through the Migration Skill Assessment (MSA) process. The applicants who want to get migrated to Australia through the Migration Points Testing System need Engineers Australia migration assessment to be done so that they can apply for the required visa. What are the Eligibility Criteria for Engineers Australia Skill Assessment? Engineers Australia assessment criteria comprise of two main requirements - English Language Competency and Appropriate Qualifications. The engineers applying for migration to Australia have to nominate an occupation which is listed in the Immigration Australia Occupation List. Based on their occupation the applicants need to select a dedicated pathway of their skill assessment as mentioned in the Engineers Australia MSA booklet (Migration Skill Assessment Booklet). It is solely the responsibility of the applicant to choose the right pathway for their skill assessment. How to choose the assessment Pathway? 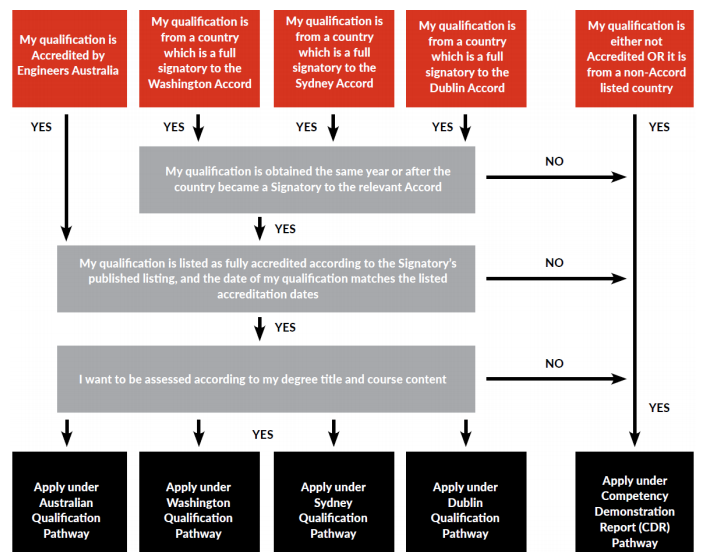 The acceptance scores for the Engineers Australia IELTS requirement and other criteria are given below. The test results of these should be older than two years at the time of filing the application for skill assessment. Firstly, the applicants have to apply for Migration Skill Assessment Online. 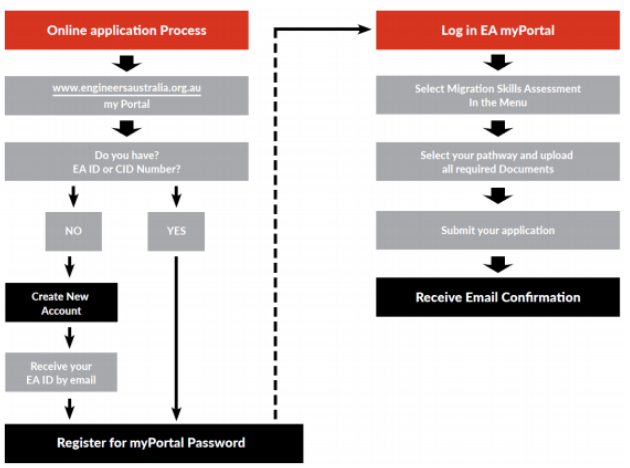 For first time applicants, they need to generate an EA ID number by registering themselves through their portal of Engineers Australia. then, they have to select their pathway of assessment and hence submit the required documents and pay the Engineers Australia assessment fees. The following flowchart will help you understand the Engineers Australia skills assessment timeline in a nutshell. During the assessment period, the applicants can log into the portal of Engineers Australia and check the status of their application. An important thing to note here is that the assessor of your application will evaluate it on the basis of the documents that you have submitted. The applicants would not be asked to submit any further documents once the process of assessment starts. However, in certain cases, if the assessor required some additional information then you must provide the relevant documentation as early as possible as the request for additional information remains for only one month’s time period on the portal. Inability to submit the required documentation can lead to an unsuccessful result of the applicant. The Engineers Australia assessment time of the application may vary depending upon the number of applications present at that time with the assessing authority. The applicants should seek the updates through the portal only and should not contact Engineers Australia in this time frame. What is engineers Australia assessment outcome letter? In case of successful assessment of the skills and competencies of the applicants, an assessment outcome is sent to the applicant via email. It is an outcome letter that can be used by the applicant for migration purposes. If the applicant is not happy with the outcome they can go for an Informal Review of the same within three months of receiving the outcome letter. In the informal review process, the application is reviewed by an independent assessor. This process may take up to eight weeks and requires a separate processing fee. After the review, the result is provided to the applicant via email. However, if the applicant is not happy with the result of the informal review as well, they may opt for seeking a Formal Appeal within 6 months of receiving the first outcome of the assessment. The process can take up to nine months and again requires additional review fees. In this process, an independent panel of professional engineers reviews the application. The result of the formal appeal is considered as Final by the Engineers Australia. After receiving the Migration Skill Assessment Outcome the applicants may apply for Engineers Australia membership. It gives them an opportunity to boost their career in Australia, connect with various employers and experts, expand their knowledge and build a network. It is indeed important for the applicants to know that they must maintain the code of Ethics of Engineers Australia. The applicants must take care of fraudulent and plagiarism issues in their application. Any kind of false or misleading information, if provided for migration skills assessment may lead to a 12-month ban on the applicant for applying for migration to Australia. The Engineers Australia holds the right to match the information provided by the applicants from other submitted applications or published sources.